Getting ready to haunt the downtown with merchant Meghan Mariani. It’s the season for all things creepy and spooky. Last night the Long Grove Historical Society joined forces with approx. 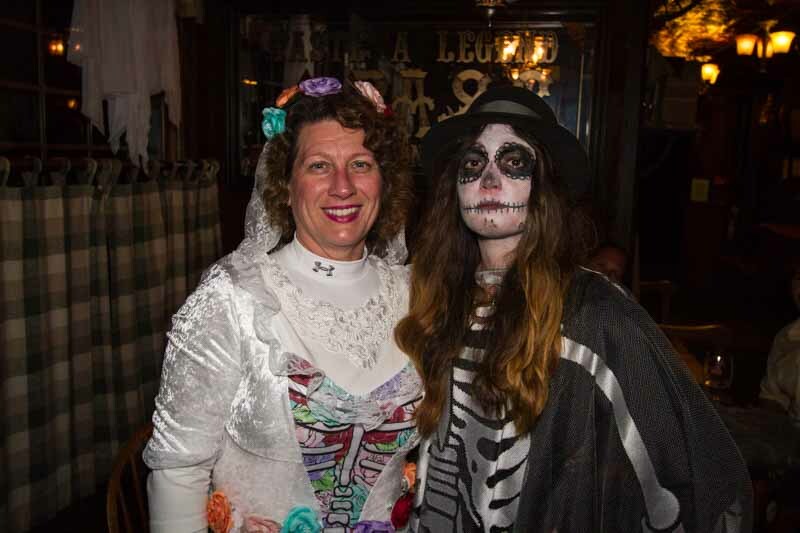 50 other merchants, community groups, and resident volunteers to create the 3rd Annual Ghost Walk, and it was a supernatural success! 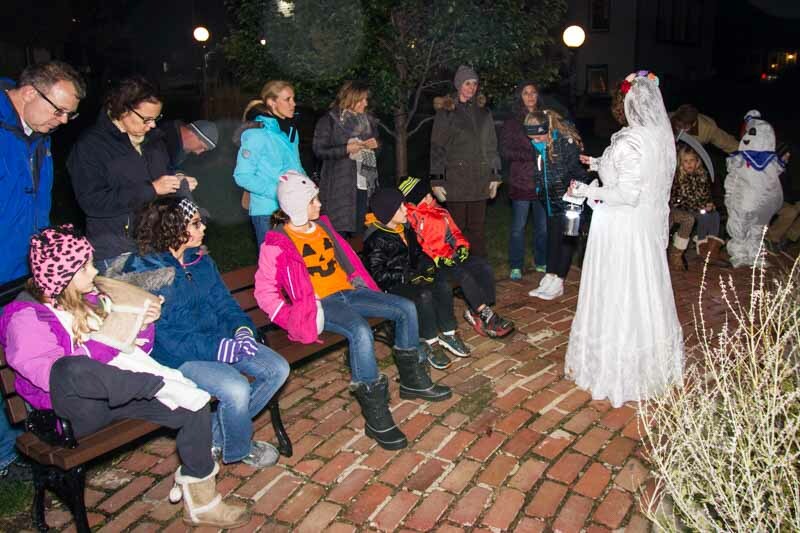 Our historic downtown was overtaken by dancing zombies, living scarecrows, ghosts, ghouls, and several former members of our community who materialized for one night to tell the living their haunted stories of times past. Over 250 members of Long Grove and the surrounding area were scared silly and speaking as one of the ones doing the terrorizing, it was great fun. One cute little three-year-old declared his bravery at the beginning of my first tour of the night, only to grab hold of my hand as soon as we encountered spooky storyteller Tobin Fraley, who told us of the gruesome demise of “Gus” the mechanic. We heard about the flagpole on Towner Green used by real-life gangster Terry Drugan, and “crazy Jake Eisler” appeared once again this year from beyond the grave to menace us with his stick of dynamite. As we made our way to the Long Grove Church’s 1800’s cemetery, the Gravedigger and his “client” warned us of the perils ahead. Across the covered bridge to safety, we made a detour through the haunted trail along the creek, featuring over 50 carved pumpkins and a few demons, zombies, and hockey masked characters brandishing chainsaws. A trip past the spooks at the haunted Historical Society farmhouse, and it was back to the comfort of toasting marshmallows over the fire pit. We even had a “Stay Puft Marshmallow Man” join us–don’t worry, he did keep a safe distance from the flames! My three-year-old victim had a great time (as did so many families who participated) and he did admit that he was “a little bit scared” but could he do it again? Happy Halloween! Members of the Long Grove Village Board at the October 27, 2015 meeting. I have never used my gavel more times in a meeting to maintain order and civility than I did last night. Things never truly got out of control, but emotions were high in the capacity crowd of Rt. 53 objectors. The mood of the room prevailed as the Trustees voted 5 to 1 in favor of a resolution declaring formal opposition to the extension of Route 53 by the Village of Long Grove. The Illinois Tollway Board is set to make a decision in December on whether or not to move forward with further engineering studies for this project. Time will tell if this action of taking a stand by Long Grove will have any effect. For those of you who are interested, below is a link to the letter written to our Village Board from Lake County Chairman Aaron Lawlor, concerning the informational meeting held last week about Route 53. This was read aloud last night by our Village Clerk and entered into the public record. The letter also contains an additional link that takes you to the Route 53 website which features video, maps, and additional details on the project. Elected officials in attendance at the October 20th Route 53 Informational Meeting include (L to R) Long Grove Village President Angie Underwood, Lake County Treasurer David Stolman, Lake County Board President Aaron Lawlor, Lake County Board Representative Sid Mathias, and Hawthorn Woods Mayor Joe Mancino. Last week our Village Board hosted a public meeting to discuss the proposed extension of Route 53. An initiative of Trustees Stan Borys and Mike Sarlitto, this meeting was billed as “neither pro nor con” on the issue, but simply a presentation of facts to better inform our residents. I don’t think anyone walked out of the meeting feeling that it was a neutral discussion. I am on the record as having objected to the last-minute timing and organization of this meeting, and the Village Board as a whole had limited opportunity to vet or approve the materials being presented. Since last Tuesday, the fallout from the meeting has been significant. County officials who were in attendance to observe (they were specifically asked not to present by Borys and Sarlitto) were treated in an unprofessional manner and have responded with a letter to “correct the false and/or misleading information that was shared in the official presentation.” Chairman Lawlor’s letter will be read tonight at our Village Board meeting and I will reprint it in my next blog entry (Route 53: Fear and Loathing Part 2). 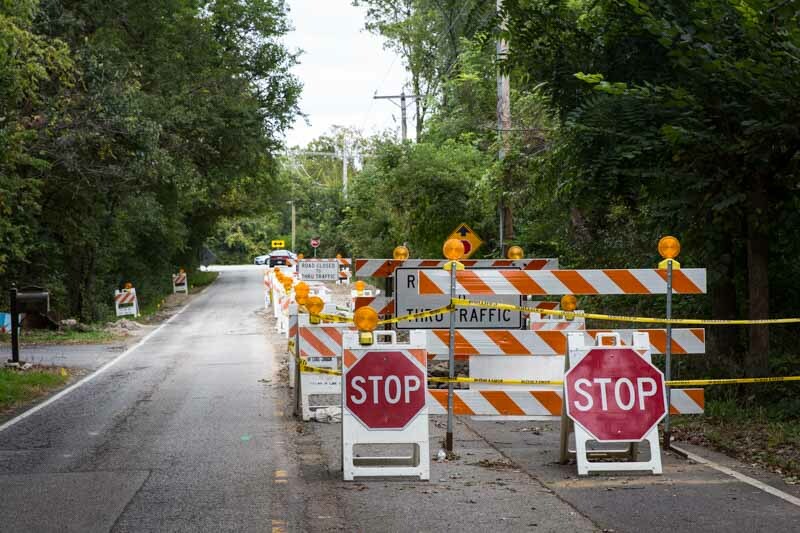 Our communication and working relationships with County officials whom Long Grove is dependent on for critical services such as police and road maintenance (think Diamond Lake Road) are now strained. My inbox has been filled with impassioned emails from residents opposing the project, many of whom live in the proposed path of the road. A few of these included threats. To better clarify my position on the matter, my opening remarks from the Oct. 20th meeting are reprinted below. Following that is the article that appeared in the Chicago Tribune describing the meeting. I first learned of the proposed Rt. 53 extension 18 years ago when my husband and I were looking for a home in Long Grove. Over the years this project has surfaced again and again for study and debate, never advancing to fruition due to lack of funds and consensus. I have never been in favor of this project. If it were all up to me, I would preserve our beautiful open spaces and natural areas as they are today, and this road would never be built. However, I am also aware that many residents do support this project. I don’t believe that I was elected to advocate for my personal point of view, but rather to be a representative for ALL Long Grove residents. Shortly after I took office, I was asked to participate in committees to further study the Route 53/120 Extension. In the past two years, I have attended over 15 of these meetings and I have witnessed firsthand the strong support this project has within both the County and State. At this time, the decision whether or not to advance the Route 53/120 extension rests with the Tollway and our State legislatures. If the road is eventually constructed, it will be dependent on many future decisions of which Long Grove’s active involvement will be crucial, particularly in safeguarding our environmental concerns. 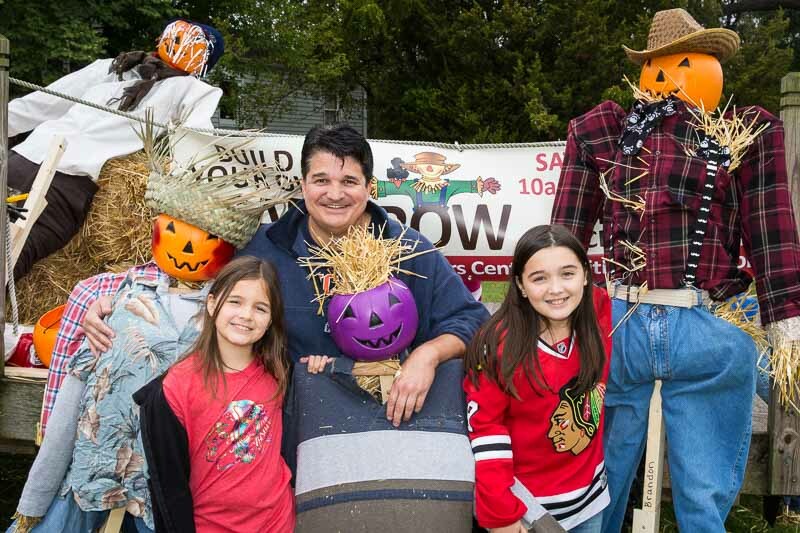 The Gayton family had fun creating one of the scarecrows currently standing guard in our downtown. Several weeks ago the Long Grove Business and Community Partners Organization sponsored a fun family event on Towner Green. With the help of handy volunteers such as John Kopecky and Ryan Messner, adults and kids alike created several dozen unique and creative scarecrows who now stand at watch in our historic downtown. Some have heads made out of gourds, some of plastic pumpkins, others are completely original like the frankenstein face painted on a recycled milk jug. When my husband and I happened on to the stuffing and decorating festivities, one clever young resident suggested that we need a “Village President” scarecrow. Next year I really want to participate in this–ideas are already swirling in my head on what my alter ego should wear and how scary her face will be! These watchful guardians are also going to add some spooky ambiance to the Historical Society’s Ghost Walk this coming Friday night. In the meantime, these temporary harvest-time sentinels bring a smile to my face every time I pass by Towner Green, and are a reminder of Long Grove’s farming past. Will any of these scarecrows come alive during the Ghost Walk? Stay tuned to find out! The recent warm Indian Summer days have been lovely, and it has been such a treat to be able to open the windows and enjoy the fresh autumn breezes that we all know are quickly going to turn cold. Unless of course, you live on Cuba Road. Residents in these million-dollar homes have had to close their windows as of late, in an effort to keep from invoking images of “the slums of a third-world country,” as was described to me by one resident. Slums, in Long Grove? Well, it only smells that way. On the night of September 18th, a sanitary sewer owned and maintained by the Village of Lake Zurich collapsed on East Cuba Road in Long Grove, leaving a large hole in the pavement over the open sewer pipe. Originally thought to be a week or two of repairs, the problem has been found to be more extensive and a much larger section of pipe needs to be replaced. Final costs are still not in, but Lake Zurich has recently authorized an ordinance to issue up to $1.5 million in bonds to pay for the work, which could take as long as six weeks. Yes, back to the sweet Long Grove smells of autumn bonfires and apple cider donuts. ASAP! 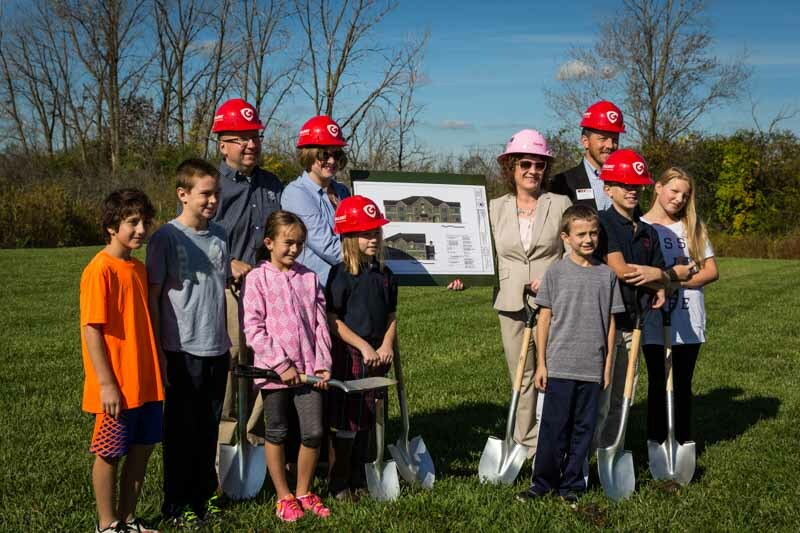 At the ground breaking ceremony this past Saturday for the new Primrose School in Long Grove. This weekend I was excited to take part in two celebrations of new beginnings. A ground breaking ceremony was held for the new Primrose School of Long Grove, to be built at the corner of Rt. 22 and Old McHenry Road, just north of Smokin T’s BBQ. Business owner Jennifer Wierzchon and her family were on hand to mark the occasion and I can testify that the kids had a blast digging and ground truly was broken! Some worms were even unearthed to join the festivities. Primrose School will be a welcome addition to our community and it will offer high-quality early childhood education, overlooking a beautiful natural setting. In our recent community-wide survey residents responded that the quality of education in Long Grove was the feature that most attracted them to our community, followed by the abundance of open space. Primrose School is poised to offer both of these attributes to our young families who have already chosen Long Grove as a great place to raise their children, and to those yet to come in the future. I wish them the best of success! Following this happy event, I attended a ribbon cutting ceremony at Broken Earth Winery on Robert Parker Coffin Road at the upper level of the Mill Pond Shoppes. Owned by the Forsythe family, this beautiful wine bar offers a California wine tasting experience featuring their own wines originating from the family-owned vineyards in Paso Robles, California. Broken Earth is actually celebrating their one year anniversary, having opened last October but continuing to expand over the past year to add more seating both indoors and out. I can admit to being a regular “taster” of their wines, and this local gathering spot has become a favorite place to relax at the end of a long week. After the ceremonial ribbon was cut, we all raised our glasses in a toast to another year of prosperity and growth in our historic downtown! At the ribbon cutting celebrating the one year anniversary of Broken Earth Winery. 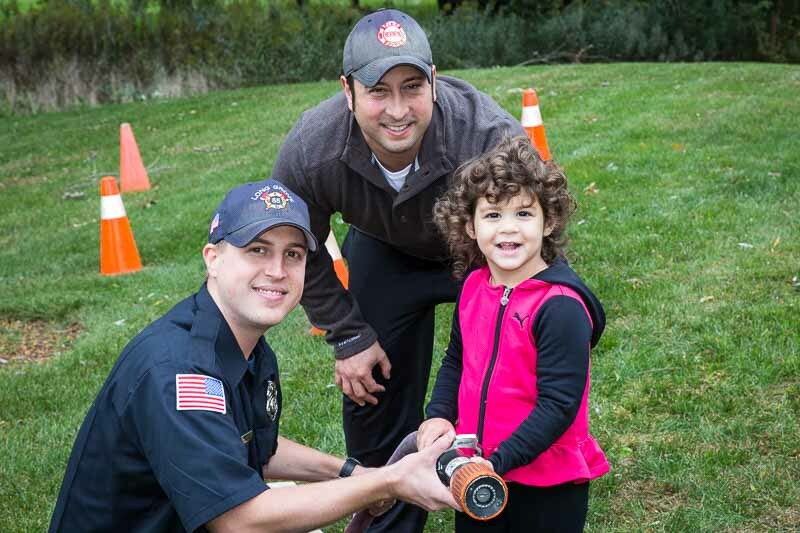 Members of the Long Grove Fire Protection District teach a young recruit how to handle the fire hose. We are smack dab in the middle of National Fire Prevention Week, so in honor of that I would like to give a shout out today to our local firefighters here in Long Grove. Our community is actually served by two separate districts that respond to emergencies in the area: Long Grove Fire Protection District and Countryside Fire Protection District. A community Open House was held this past Saturday at the fire station in downtown Long Grove, and it was a delight to be on hand to see the local kids having fun while learning about fire safety. In my mind, there is no truck more colorful or fascinating than a firetruck. Many years ago, I was even lucky enough to get to ride atop one once in a homecoming parade–what a thrill! This weekend a large number of families took the opportunity to enjoy hot dogs, station tours, demonstrations, and kids activities while meeting staff and checking out the awesome trucks. I was very, very tempted to take a turn with the kids sliding down the fire pole, and only the threat of being caught in a picture and subsequently mocked on social media kept me at bay. One thing that I did thoroughly enjoy was watching the little ones tackle the firefighter’s obstacle course, complete with hosing down a pretend house of flames. I even got to handle a real fire axe–could this be what I really need to keep my Trustees in line? My gavel seems rather wimpy by comparison! 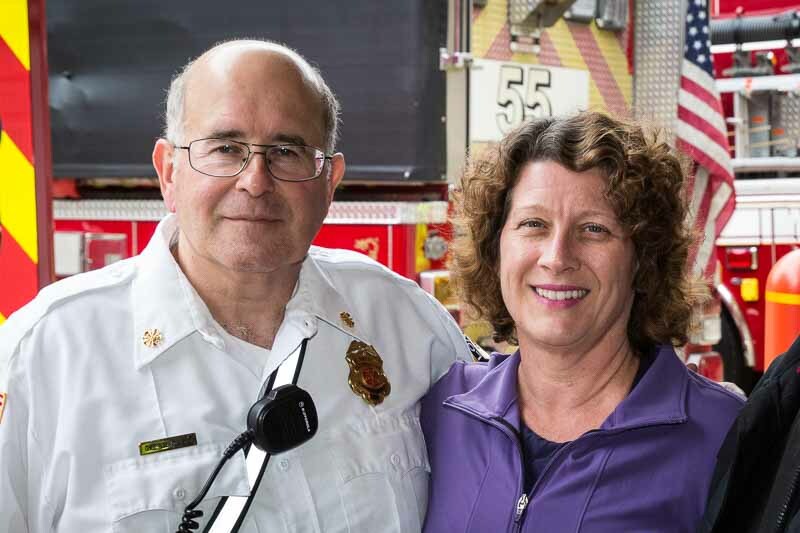 Visiting with Long Grove Fire Chief Robert Turpel during the Open House. Our lost cat, answering to the name of Bones, has not been seen since the 2014 Ghost Walk. Will he materialize again this year? This week I attended a planning meeting for the Historical Society’s 3rd Annual Ghost Walk, and the spooks are psyched for another fantastic event this year. When you gather together a group of creative locals who have a love of all things scary and creepy, the Halloween spirit truly comes alive! What started out several years ago as a “Long Grove Lurid Legends” storytelling performance, has evolved into a hauntingly fun family fundraiser involving many diverse community groups. The Ghost Walk features short tales of history and mystery presented by costumed docents and community volunteers. Various historic buildings and locations in our crossroads business district serve as backdrops for the scenes. As an actor in the skits for the past two years, I can attest to the fun to be had for volunteers and participants alike. The families love the frightful but safe encounters, and we get a kick out of scaring the kids silly. But what I think is truly special about the Ghost Walk is the way the Long Grove community has come together to support and build an event that is a win-win for all. We have more merchants than ever participating this year, and “Crazy Jake Eisler” is materializing again to blow things up in his own special way. In Motion dance studio has a thrilling performance in the works. And rumor has it that the youth group of the Long Grove Community Church has got something spooky planned in front of their atmospheric 1800’s era cemetery. I can’t wait for the haunting to begin!